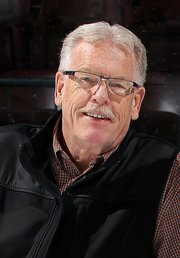 Jack McGee Kawartha Komets co-founder (with his wife Carol), David Fisher, has been chosen as one of the inductees to Peterborough's Pathway of Fame. The slate of inductees for 2013 was announced in the Peterborough Examiner today. "David W. Fisher has been an organizer since his teen years when he ran a neighborhood racing car fan club, the Eliminators Car Club. He later organized Couriers for Christ, in which young people helped run weekend crusades. He ran a local bookstore and helped start the Kawartha Church Slo-Pitch League. He started the Epistle Sports Ministries, a charitable organization which over thirty years or so provided chaplaincy services to the Toronto Blue Jays, the Peterborough Petes and other sports organizations. In 2003, he went to Slovak Republic to teach children how to play baseball. In 2009, with his wife Carol, he founded the Kawartha Komets Special Needs Hockey Program, which now has three teams providing opportunities for over fifty players. His counselling energies are channelled through Friends Peterborough. He is a Paul Harris Fellow, a special Rotary Club honour. His lifetime of experiences has depended upon his organizational skills, confidence and willingness to help others." For the complete newspaper article listing all of the 11 inductees for 2013, please click here.